The Radio Times may no longer be the best-selling magazine in the UK – but it still claims to be the most valuable magazine on the newsstand and the title with the most subscribers as it celebrates its 90th birthday this week. In the first half of this year it was the third best-selling title overall in the UK with average weekly sales of 812,543 (down 6.1 per cent year on year) – behind cheaper competitors TV Choice and What’s On TV. It costs £.160 a week and has some 229,024 subscribers. Radio Times survived the loss of its monopoly (with TV Times) on printing BBC/ITV listings in 1991. And it is looking to the future with a fast-growing website which is approaching three million unique users a month (for more on that see feature later this week on www.pressgazette.co.uk). Here is Press Gazette's selection of the ten best Radio Times covers of the last 90 years (plus the current souvenir issue) as well some amazing facts about one of Britain’s great journalistic institutions. The longest running TV and radio listings magazine in the world. 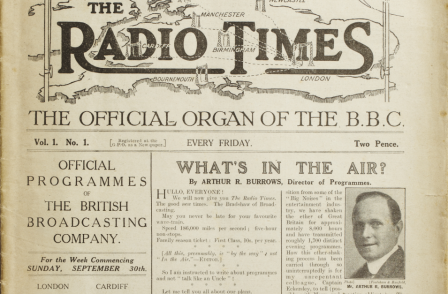 Following an ultimatum from the Newspaper Publishers' Association demanding a fee for publications to carry radio listings the BBC's first director-general, John Reith, decided to publish a dedicated listings magazine – the first issue of The Radio Times, 'the official organ of the BBC', went on sale on Friday 28 September 1923 priced at 2p. 2 November 1936: Radio Times became the world's first television listings magazine with two pages of TV listings following the start of the first 405-line high-definition service. By September 1939, Radio Times was devoting three pages a week to television, but when war was declared on 3 September, TV closed down and the nation turned once again to the wireless. ‘Broadcasting carries on!’ announced the first wartime RT, but there was only one station, the newly christened Home Service. Despite the war, Radio Times never missed an edition (1940 edition below). 1953: Coronation edition with a map of the procession route by Cecil Bacon. Television listings are moved from the back of the magazine. Daleks are Radio Times cover stars in 1966. July 1967: BBC2 becomes Britain’s first colour television channel, and Radio Times adds 'colour' annotations alongside some programme listings. 1979 Fawlty Towers front page edition. 1988: Radio Times gains a place in the Guinness Book of Records when the Christmas edition sells 11,220,666 copies, making it the biggest selling edition of any British magazine in history. 1991: the BBC/ITV monopoly on printing their programme listings is abolished. Radio Times responds with a new look 116 page magazine listing all channels (edition from 1995 below). 2005: Vote Dalek cover combines the general election with a Dalek story – this is voted the Great Cover of all time in the Periodical Publishers Association’s (PPA) Great Cover Debate in 2008. 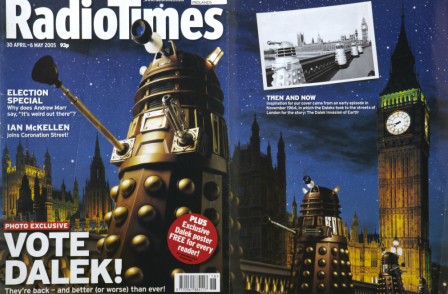 November 2011 – Radio Times sold by BBC Worldwide, now owned by Immediate Media. Radio Times double issue, featuring the Snowman and the Snowdog on the front cover, sold 2,175,056 copies, up from 2,109,292 in 2011 – the biggest year on year increase for a Radio Times Christmas issue since the deregulation of the listings market in 1991.